Star Trek has inspired dozens of video games over the years, including some of the very first, but it has produced few masterpieces. But perhaps just as director J.J. Abrams re-launched the aging movie series with a new sense of excitement and wonder, an accomplished game-maker can give new life to Star Trek-based video games? That's what Digital Extremes, a team of developers who helped make BioShock 2, hope to do with a new game for Xbox 360, PlayStation 3, and PC, slated to release around the time of another new Star Trek movie in 2012. This time, Star Trek has inspired a third-person shooter game similar in gameplay to Gears of War, with a heavy emphasize on cooperative multiplayer. We saw a behind-closed-doors demonstration of the game in Paramount Digital Entertainment's meeting room at the E3 video game conference in Los Angeles last week, so here's what to expect from the new game. If you want to see the game in motion, watch the new Star Trek trailer we covered last week. Cooperative multiplayer games let you work together with friends online to complete the game's missions. This style of play has become increasingly popular in recent years, and Star Trek capitalizes on that growing popularity, expanding on the idea in a lot of new and interesting ways. Kirk and Spock have distinct abilities and equipment, so each player will have to use different strategies. Spock is sneakier and more cerebral, requiring complex tactics and stealth maneuvers, while Kirk prefers to march "where angels fear to tread," to quote one Star Trek film. Kirk is more comfortable in direct combat, in other words. Even the story-telling cinematic moments that break up the actual gameplay are different for the player Kirk or the player playing Spock. Few games have played with perspective in this way, so it should prove an interesting opportunity to explore new ideas and new ways of telling stories. It also means that dedicated players will have reason to play through the game twice — once as each character. Finally, moments in the game require players to rely on one another to survive. In one example Paramount and Digital Extremes showed us, Kirk was injured and Spock had to carry him down a corridor. 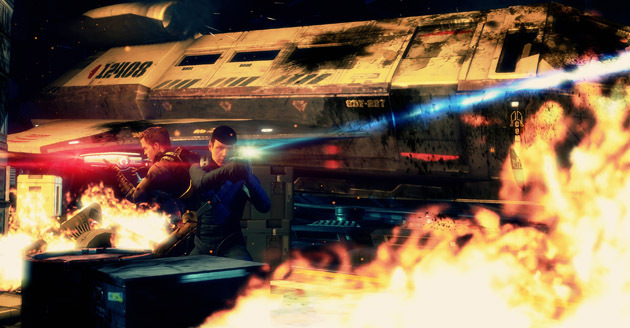 Navigating with Kirk attached occupies the player playing Spock, preventing him or her from shooting, while the player playing Kirk must use the Captain's one free arm to shoot at enemies. Star Trek has always been about more than space battles — it's about the characters, the story, and the theme of humanity overcoming its struggles to do great things. Star Trek fans expect nothing less than that, so to make sure that crowd is happy the creators of this new game have enlisted the writers of the new Star Trek movies. Roberto Orci and Alex Kurtzman wrote the 2009 Star Trek film, and are currently penning the new one set to come out in 2012. But they're also working with BAFTA award winner and God of War writer Marianne Krawczyk on the story for this game, which takes place between the first and second films in the new series. Damon Lindelof, another major figure in the new Star Trek franchise, is also involved in the game's development. The presenter from Digital Extremes gave several examples about how the tone and aesthetics of the new films are being preserved in this game. In addition to the overgenerous use of lens flare effects (a staple established by director J.J. Abrams), the writers have attempted to preserve the general air of levity that fans of the 2009 film enjoyed. 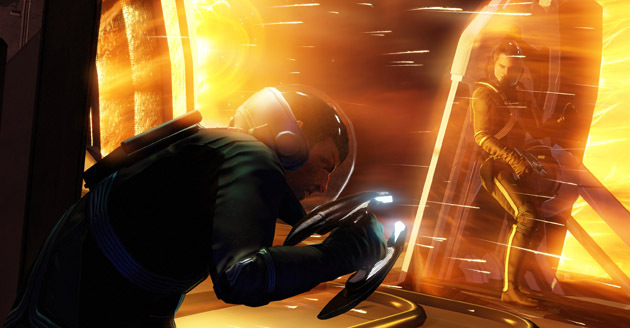 The likenesses of actors Zachary Quinto (Spock) and Christopher Pine (Kirk) are used for the in-game characters, though the voices have not been finalized yet. Digital Extremes hopes that both actors will lend their voices to the game by the time the game launches next year, though.